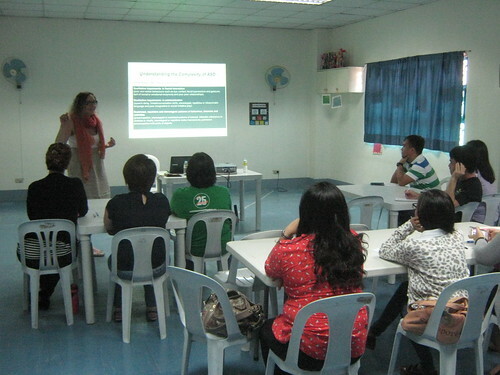 The Autism Society Philippines was fortunate to host an RDI seminar last 27 September 2014, with Ms. Renee Dela Cruz. Renee is an autism specialist with 15 years experience, based in Melbourne, Australia. She has a psychology background, is completing a masters/PHD in Autism Studies and is a certified RDI consultant. Renee is skilled in functional behaviour analysis; modification, psychological assessments; diagnosis, and delivering intervention services designed to enhance functioning and quality of life. She assists families to move from diagnosis to active remediation, implementing intervention plans that are tailored to the child's and family’s needs. She guides families to break down complex behaviours, work through anger/anxiety issues, discover opportunities to reestablish developmental milestones and guides parents to develop their child's thinking skills. Renee discussed how RDI is all about connecting, thinking and growing. The approach teaches children how to be connected with their parents, whether they are verbal or not. She spoke about teaching and behavior modification techniques, as well as many ways to communicate with someone with autism. I learned that parents play a big role in making people with autism kind, gentle, and warm hearted. About the contributor. Lloyd Ngo was first an ASP intern when he attended Independent Living and Learning Center. He began working in 2012 as an encoder at the Ongkiko Manhit Custodio and Acorda Law Offices in Makati. He is currently ASP’s Program Assistant for Communications.